Estou completamente apaixonada por esse glitter da Michele Pâmela! Ele é muito lindo e fácil de trabalhar! E claro que merecia mais uma maquiagem por aqui! I'm completely in love with the glitter from Michele Pâmela! It is so beautiful and easy to work with! And of course, it deserved one more look here! Começo iluminando abaixo da sobrancelha com uma sombra bege opaca (Powdered Sugar), depois esfumo o côncavo com uma sombra rosa bebê opaca (Sugar Daddy) e por cima aplico e esfumo uma sombra marrom claro opaco (Gingerbread Latte). I begin highlighting the brow bone with a matte beige eyeshadow (Powdered Sugar), then I blend in the crease a matte baby pink eyeshadow (Sugar Daddy) and over it, I apply and blend a light matte brown (Gingerbread Latte). Na diagonal, aplico e esfumo do canto externo até o centro da pálpebra côncavo uma sombra rosa fuchsia (Gumdrop), escureço o canto externo com uma sombra roxa média opaca (Figgy Pudding) e na parte interna da pálpebra aplico a sombra rosa bebê opaca (Sugar Daddy), esfumando pra não ter marcações. In diagonal, I apply and blend from the outer corner to the center of the lid fuchsia pink eyeshadow (Gumdrop), darken up the outer corner with a matte medium-dark berry eyeshadow (Figgy Pudding) and in the inner part of the lid I applied the matte baby pink eyeshadow (Sugar Daddy), blending the edges to not have harsh lines. Traço um delinedo gatinho fino e aplico do canto interno até a metade da pálpebra o glitter reflects pink sem usar cola de glitter. I do a thin winged eyeliner and I apply from the inner corner to the center of the lid the reflects pink glitter, without using any glitter glue. Aplico um lápis preto na linha d'água e esfumo. Por cima aplico a sombra sombra roxa média opaca (Figgy Pudding) e esfumo com a sombra rosa fuchsia (Gumdrop). I apply a black pencil liner on the waterline and smudge. Over it, I apply a matte medium-dark berry eyeshadow (Figgy Pudding) and blend with the fuchsia pink eyeshadow (Gumdrop). Aplico uma gotinha de cola de glitter bem no cantinho interno e por cima o glitter reflects pink. Finalizo aplicando bastante máscara pra cílios. 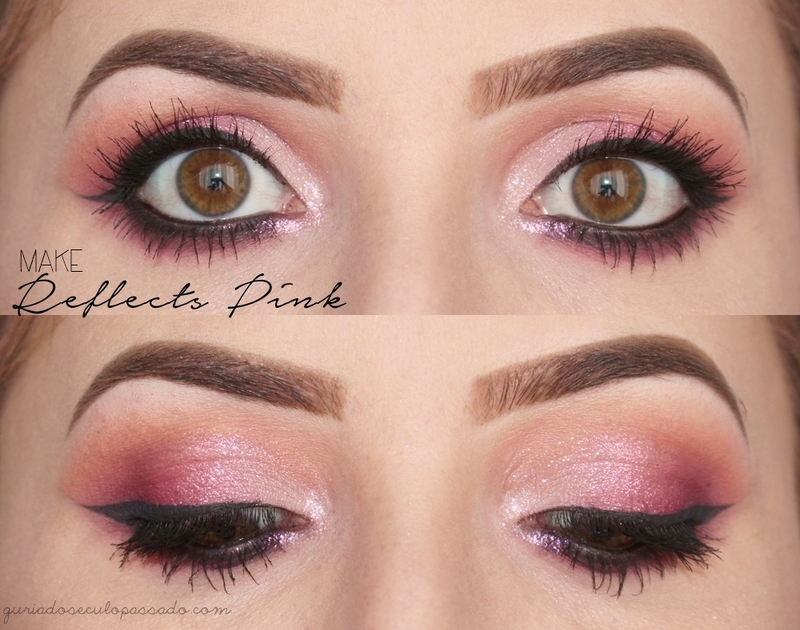 I apply a little drop of glitter glue in the very inner corner and over it, I apply the reflects pink glitter. Finish the look applying some coats of mascara. Achei esse glitter uma lindeza que só! Suas maquiagens são tão lindas, amo quando você usa tons mais rosados, combinam tanto contigo! Menina você arrasa demais!! Sério, você faz cada maquiagem incrível, fico babando! ameeeeeeeei a make, linda demais!! amo rosa! E essa combinação de cores, o esfumado e esse delineado são perfeitos.